Beacon Hill is is one of the most picturesque neighborhood in Downtown Boston. Its blend withVictorian brick walls and Federal style walkway fills the atmosphere with rich historical scent. Before we landed in Boston, the husband and wife-to-be have designated this place to be a mandatory destination for our photo shoot. Nevertheless, soon as we got to this street, the sky started drizzling. Fear no more, Patty and Tyler actually bough an iconic clear umbrella prior to the shoot. 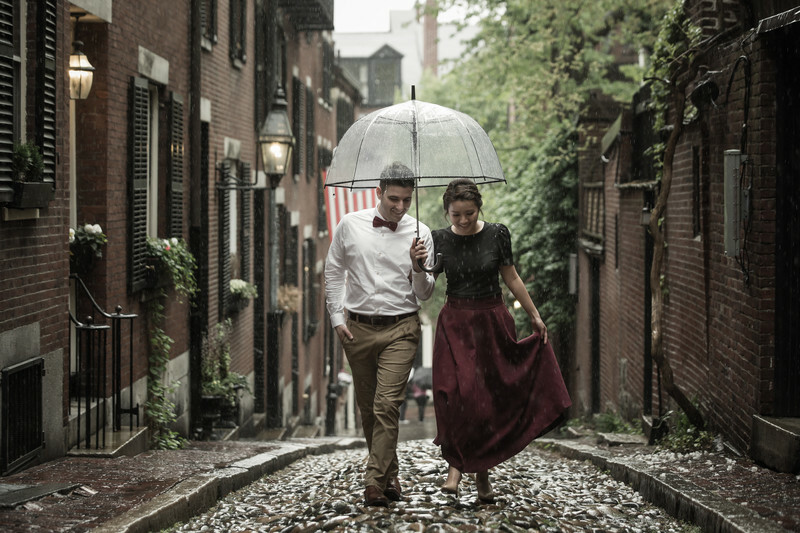 Shooting in the rain with a couple holding a cute and clear umbrella has been my to-do this for as long as I remember. Usually I let the bride and groom to decide if there's any props they'd like to bring. I like to let the day flow without over-staging any moments.